With other parts of the country offering less than impressive buy-to-let opportunities, Liverpool is fast becoming a contender to the rental throne. Should You Be Investing In Liverpool’s Property Market? More and more property investors are looking away from the traditional big 3 investment cities – London, Manchester and Birmingham – in order to find the next addition to their portfolios. While yields remain good in these three cities, much of the property currently available there is either overpriced or unsuitable for the rental market. In short, many of the bargains have already been snapped up. So, where is the next great market going to emerge? Many professional investors are now looking to the banks of the Mersey and beyond for places to buy. The 2008 City of Culture is regarded as one of the hottest cities in the UK at the moment, and when you look at the figures it’s easy to see why. Back in 2013, the Office for National Statistics named 21 different places across England and Wales that had house prices averaging at £50k or less – three of those 21 places were all within Liverpool’s boundaries. The working class population were hit especially hard by the recession that followed the 2008 financial crisis, and redundancies led to many properties being repossessed. Thanks to the lack of interest, until now, many of these properties have remained unsold, with sellers desperate to sell and prices reflecting this. Areas such as Bank Hall, Anfield, Kirkdale and Sandhills all have properties way below average prices for the wider area, and canny investors are snapping these up at a rate of knots. For instance, the average price for a terraced house in Kirkdale in 2013/2014 was £75,770 according to HM Land Registry statistics, but the Liverpool Echo recently reported prices of £46,000 or less. Opportunities like these do not last forever, so it is little wonder that investors from the south of England are sitting up and taking notice. Liverpool’s high demand for prime waterfront properties has led to some interesting regeneration projects springing up in the city’s docklands region. Areas such as Stanley Dock are set for a much needed makeover, with £130m being earmarked for the scheme. 448 apartments and business units look set to be built in Phase 2 of the operation and additional facilities such as a 3,375 square metre exhibition space, hotels, eateries and offices will only add to the areas overall appeal. Another such project is X1 The Terrace, part of the award winning X1 The Quarter. Set for completion in September 2016, the new development will add 101 new one, two and three bedroom apartments to the docklands region. X1 offers a new and exciting addition to the waterfront, one that will give prospective residents an opportunity to experience luxury urban living at its finest. Set in what is proving to be a very desirable part of the city indeed, X1 looks certain to become one of the most sought after developments in Liverpool. Another reason for interest from investors outside of the local area is the fact that the city has 3 thriving universities. Decent student accommodation is hard to come by in the city and with over 50,000 students, 6,000 of which are from overseas, this is an issue that needs to be addressed. Investors are seeing this as an opportunity, and properties around the University of Liverpool, Liverpool John Moores University and Liverpool Hope University are being bought up and transformed into dwellings suitable for student accommodation. Another point that attracts investors is yields. Yields are calculated by measuring the rental income gained from a property against the cost of purchase. Liverpool performs well in this area too, with new research by HSBC showing that the city is in the top ten most attractive places to hold a buy-to-let property. Yields in Liverpool stand at 6.38% and 21.75% of the city’s entire housing stock is currently being privately rented. The north west of England is currently enjoying extremely high yields and, coupled with Liverpool’s large student population, the city looks set for a potential property boom. Stable rents along with low property prices give investors a dream scenario. 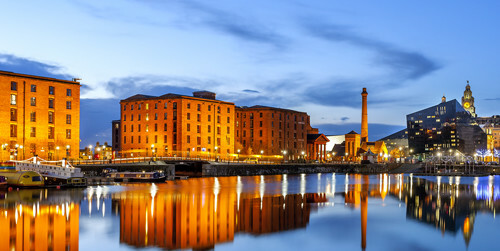 Will Liverpool be the UKs next property hotspot? Time will tell, but one thing is for sure – things are certainly looking up for the property market in The Pool.